The Basil Bremen Bicycle Basket is a practical choice of storage that easily fits to the front of your bike. 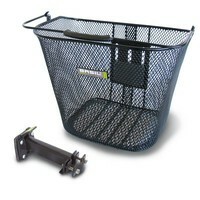 This handy bike basket is adjustable in height and can be easily mounted on the handlebars of your frame. A convenient choice for carrying extra loads on your bike, both men and women will love this basket thanks to its eye-catching and versatile design. If you’re regularly in need of a load-bearing basket that won’t you down, the Bremen is the perfect choice. The fine-grained steel construction makes it ideal for handling larger loads. Great for trips to the grocery store or market, this basket is also a go-to for carting daily essentials from A to B and back again. 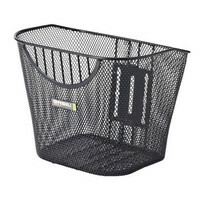 The dimensions of this basket are 34 x 25 x 27 cm, providing you with ample space for all those essentials. Designed for fitting to your bike with a TÜV-certified Permanent-system II, this basket is suitable for handlebar stems with a diameter of 22 to 25.4 mm. 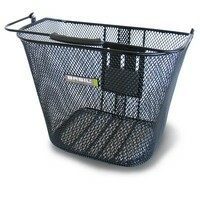 All the essential attachments are included, meaning you’re good to go as soon this basket is out of the box. Looking for more must-have items for your bicycle? Browse the complete range of bicycle bags and accessories online today at Basil and find the perfect fit for your frame. 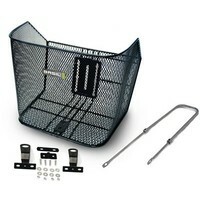 Basil Bremen bicycle basket comes with Permanent-System II EC mounting fixtures. Designed for attachment to your handlebars. A very nice fixed front basket. Somewhat older more traditional in style. It comes with the upper mount to the stem and you can also use the Boston bottom stay if you need or want a more stable mount.